Christina Aguilera is a giver, not a taker. The Voice mentor, who turned 32 Tuesday Dec. 18, opted to gift fellow mentor Blake Shelton with an unusual present during the singing competition’s season finale - even though it was her own big day to shine. During one of the commercial breaks, the "Your Body" singer hopped out of her chair to present the country singer with a gift box that turned out to be what looked like a stuffed chipmunk in a domed glass case. The two judges chatted excitedly and posed with the gift before Aguilera toted the case over to both Adam Levine and Cee Lo Green's chairs to see, explaining the present to each of her fellow judges. 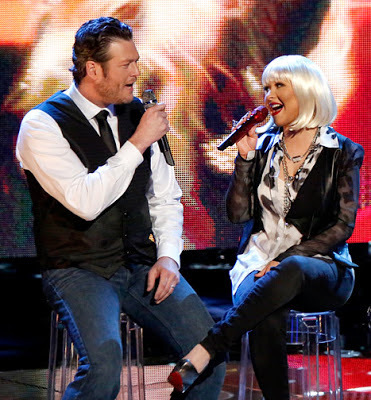 After dropping the unusual gift back at Shelton's chair, Aguilera blew him a few of her signature air kisses before settling back into her seat. Not that Aguilera didn't get her share of gifts and well wishes throughout the night as well. Earlier in the evening, a group of earnest fans sang Aguilera "Happy Birthday," and show producer Mark Burnett made an appearance to present her with a cellophane-wrapped gift. Even music legend Smokey Robinson, who took the stage for a duet with finalist Nicholas David, took a moment to blow Aguilera a few kisses and mouth "Happy Birthday" as well. It was the perfect way for Aguilera to close out her time on the show - she and Green will be going on hiatus for the coming season, with Shakira and Usher stepping in to fill their mentor seats. "Thank you #Fighters for the many sweet birthday messages today! Let There Be Love to you all! XoXtina," she tweeted to fans Tuesday.